George Takei, Abraham Lincoln, and the Oregon Symphony – three great tastes that taste great together? When we first learned that George Takei will be serving as the narrator for the Oregon Symphony’s 2017-18 season opening night performance of Aaron Copland’s orchestral tribute to Abraham Lincoln, we were more than a little confused. Upon further investigation, we’re quite simply blown away. “Oh… myyyy…” indeed! Maybe you think of George Takei as the eccentric actor whose catchphrase “Oh… myyy” highlighted a variety of television shows and commercials. Or, maybe you know him because of his social activism. It’s possible you follow his incredibly popular Twitter account @GeorgeTakei. At Stumped in Stumptown, our first memories of Mr. Takei stem from his portrayal of Lt. Hikaru Sulu in the original Star Trek TV series and subsequent movie sequels (many of us hold the incredibly unpopular opinion that the original Star Trek was the best Star Trek). So, it’s no wonder we were surprised to discover that Takei will perform the 15-minute narration Copland created for his symphony incorporating some of Abraham Lincoln’s best-known speeches. Not Mr. Takei’s first rodeo. Mr. Takei seeks to raise awareness of the Japanese internment camps. Mr. Takei has connections to Portland. Mr. Takei’s favorite Star Trek episode and movie. The Oregonian wisely inquired Mr. Takei for his favorite Star Trek episode and movie. Favorite episode? “My favorite episode of the TV series is ‘Naked Time’ (Season 1, Episode 4), where I whip off my shirt and get my fencing foil and terrorize the crew of the starship Enterprise with my swashbuckling prowess.”Favorite movie? “My favorite movie is the sixth movie (Star Trek VI: The Undiscovered Country), where, at long last, Sulu gets his own command, his own starship (the U.S.S. Excelsior), which is bigger than the starship Enterprise, more up-to-date, with more cutting-edge technology.” We loved the Excelsior ourselves, whose first appearance was in Star Trek III: The Search for Spock. Sulu’s appearance as the captain of the Excelsior in Star Trek VI took our collective breath away (We’re Trekkies – we know, we know). Interested in attending the symphony this Saturday, September 16, 2017? The show starts at 7:30 p.m. and tickets may still be available from the Oregon Symphony’s website with prices starting at $40. To read The Oregonian’s entire in-depth feature story on George Takei, click here – we highly recommend you check it out. 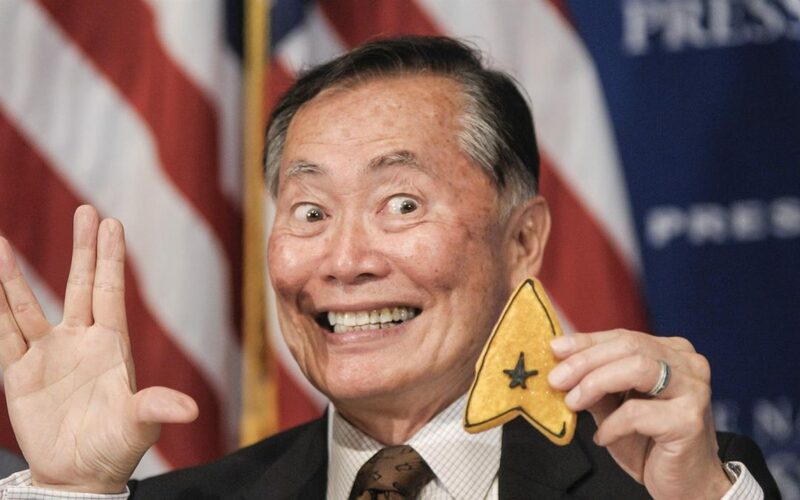 In the meantime, we salute you, Mr. Takei. You are an amazing individual whom we love, and we hope you live long and prosper!